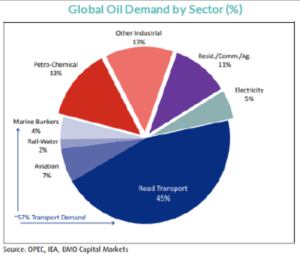 “What more can possibly be said to convince investors that the turn is real and that the fundamentals for oil in the short, medium, and long term are overwhelmingly bullish?? ?” A bold statement straight out of the Ninepoint Partners’ Energy Strategy, April 2018, written by senior Portfolio Manager, Eric Nuttall. In the past three years of the Ninepoint Energy Commentary, they’ve made oil price projections and have hit them —other than one that undershot. Now Eric Nuttal and crew are calling for a multi year, bull oil market, from $80 in 2019 to $100 in the next few years. The bull market has arrived for all the reasons we’ve been blogging about: 1) Lack of investment by OPEC (between 2020-2022 OPEC has no major projects coming online), and 2) non-OPEC/US production is about to go into a multi-year decline as well, and not even US shale can keep up with the demand growth. (Demand is up to 2.2MM Bbl/d, a growth that’s expected to continue into the 2030s, mainly due to developing countries and population growth). So what does Eric leave us with? “The risk versus reward in the energy sector is the best that I have ever seen in my 15 year career.” The bulls have definitely taken over as we watch the oil landscape change again. Are you positioned for this opportunity? Read the full commentary here and an additional note from Ninepoint Energy here.